This recipe is adapted from Luke Nguyen's book called "The Songs of Sapa". The original recipe uses pork, but since I didn't have any pork, I substituted it with chicken instead. The recipe also called for fresh pineapples. Well, I didn't have any of that either, so I simply used up the leftover canned pineapples from the previous day (when I made pineapple fried rice). I added balsamic vinegar to the dish towards the end of cooking to bring out the flavours and give it a little tanginess and acidity. I suppose if using fresh pineapples, the vinegar may not be necessary, depending on whether the pineapples are sweet or sour. We loved this, and so did the kids, but of course, we omitted the chilli for them. 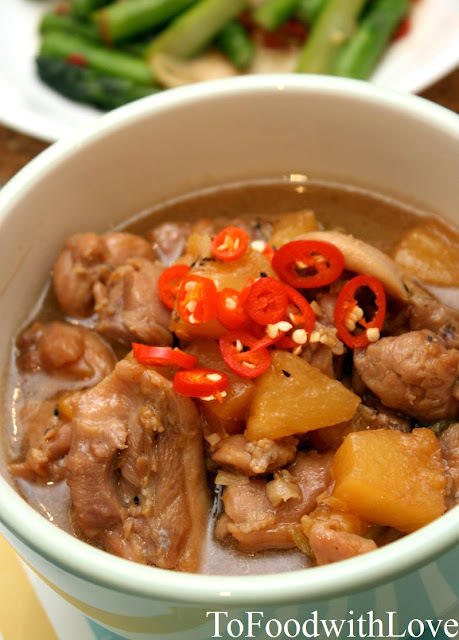 It goes perfectly with steamed jasmine rice (make sure to ladle lots of gravy over the rice), and the sliced bird's eye chillies together with the sweet, salty and sour gravy and pineapples are sure to set your tastebuds dancing! Marinade chicken with half the garlic, 2 tbsp sugar, 1 tbsp fish sauce, oyster sauce, soy sauce, 1 tsp salt, 1 tsp black pepper and cornflour. Cover and refrigerate for 30 minutes. Heat oil in a large saucepan over medium-high heat and brown the chicken, for about 3-5 minutes. Add remaining garlic and spring onions and mix well. Add pineapple, remaining 1 tbsp fish sauce and 1/2 cup water. Reduce heat to medium-low and simmer for about 15 minutes or until chicken is cooked and sauce slightly thickened. Add balsamic vinegar to taste (if using fresh pineapples, vinegar may not be necessary if there is sufficient acidity from the pineapple). Check for seasoning and add more sugar or vinegar if necessary. Transfer to a serving bowl and garnish with sliced chilli. Serve with jasmine rice.